I received an email after my last post suggesting that although Madison’s accomplishments in the drafting and ratification of the Constitution are often noted by historians, his service to our country as President is often under-appreciated. Having persevered through the last few chapters of Ralph Ketcham’s biography today with a special eye on this question, I would have to agree that Madison was an above average President, and that many of the common criticisms of his Presidency are unfair. First, Madison is often said to have radically changed his views throughout his political career, and especially while serving as President. Specifically, he is said to have broken with his 1777-8 nationalism in the 1790’s to favor States’ rights, strict Constitutionalism, and opposition to Alexander Hamilton’s federalism – only to revert back to a nationalistic stance and reliance upon “implied powers” in the early 18th century while Secretary of State and then President. My reading of Ketcham, however, has convinced me to see these (undeniable) developments in his thought as different applications of basically consistent principles in light of changing circumstances. In 1777-8, he was reacting against the threat of anarchy and infighting among the States under the Articles of Confederation; in 1791 and following, he was reacting against Hamilton’s push for centralized government, including a national bank, debt assumption, and a powerful and independent executive branch. Madison’s constitutional nationalism of 1777-8 was a different kind of nationalism then that represented by Alexander Hamilton in the early 90’s, and the danger of anarchy under the Articles of Confederation was a different kind of danger than Hamilton’s vision of unbalanced federal power. Different settings called for different stances, but his goal throughout was consistent: a robust republican form of government which is strong enough to govern and protect, but restrained by checks and balances, and subordinate to the will of the people. As Ketcham puts it, “it should not be surprising that, in a new nation, under an untried system of government, this commitment [to viable republicanism] should result in changing tactics and even reversals of fortune” (605). In addition, it must be noted that Madison’s changes were changes motivated not by selfish advantage, but sincere conviction. A good resource on this whole issue is Gordon Wood’s chapter “Is there a James Madison Problem?” in this book, in which he argues against the view that there are two different James Madisons. Second, Madison is often portrayed as a better thinker than a leader, a better theorist than an executive. In my view, there is some truth to this claim – he often gave others an impression of being irresolute and evasive, and during the War of 1812, he was far too patient with incompetent Generals and members of his cabinet. At the same time, he also gave the impression of being informed and self-possessed, and in slower, more judicial matters he exercised an effective leadership. He may not have been a dazzling leader, but neither was he an unstable one. Also, it should be noted that only a very few Presidents have possessed that rare combination of wisdom and strength that makes a truly great leader. Having to choose one or the other, I would rather a have a wise President without strength than a strong President without wisdom. Third, Madison is criticized for leading us into war. It if doubtful, however, that any President in his shoes could have kept us out of war. The truth is that British aggression at sea made war almost impossible to avoid, no matter what diplomatic efforts were made. If Madison cannot be blamed for leading us into war, however, the charge that he did not adequately prepare the nation for war has more merit. The republican ideals of the Jefferson-Madison years were at odds with having a standing army, and Madison didn’t begin to really bulk up the military until November 1811, when war was practically on our doorstep. As a result, when we declared war, the British Navy outnumbered ours 50 to 1! 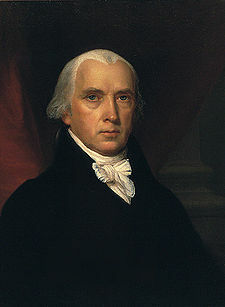 The failure to defend the capital, to strengthen and organize the military, and to oversee the general conduct of the war and make things happen is, in my view, Madison’s greatest weakness as President. For example, when the enemy was drawing dangerously close to the capital, Madison allowed General Winder to squander week after week without adequate preparation, leaving the British march to Washington almost completely unchecked. Ketcham: “presuming, as is generally warranted by the record, that Madison knew the preparations he deemed essential to the defense of Washington were not being made, he failed as commander-in-chief by not correcting the situation by whatever means necessary” (585). One of the lessons I draw from this book is that in a time of crisis, thoughtful deliberation is not enough. People need strong, decisive leadership. Also, I am reminded of the need for a strong military, which paradoxically is often the surest guardian of peace. But I think the greatest lesson we can learn from Madison has to with his lifelong concern about centralized governmental power. In this, Madison the political theorist and Madison the President both sound the same warning. He teaches us not only in his famous Federalist Paper #10, but also in his concern not over-extend executive power while a war-time President. While his lower view of executive power exposed the nation to great danger, it also reflected a healthy fear of danger in the opposite direction, where we tend to err in more recent times. In a day of preemptive wars, massive economic bailouts, a huge federal beaurocracy, a greatly expanded executive branch, and high taxing that would shock the founders, I think Madison’s concerns merit careful and critical reflection (no matter what our politics are).